Focusing on beekeeping practices, our goal is to facilitate a broad spectrum of education and promote healthy natural systems where people, honeybees and other pollinators can adapt and thrive. 5200 Shrewsbury Ave. at Hazel Ave.
Use sidewalk under the arch. The path curves to the right to the main door. of comb honey for Missouri beekeepers. will serve up his beef brisket. Club co-founder Jane Sueme will present on key spring beekeeping, new Small Hive Beetle control options and the possible resurgence of Tracheal Mites in our area. Jane will explain how you can assess your own colonies to be able to respond appropriately and have healthy, happy bees! We will have light refreshments and appreciate any snacks you want to bring and share. With 40 years of experience, Bob will share his insights covering management needs for us to consider in the next two months, after such a cold and wet winter. Brew Hub Taproom Now serving food. See menu here. meeting and presentation from 7:00 to 9:00 p.m.
we'll recap our Sustainable Stock Apiary (SSA) progress and plans for 2019. "Selling Honey for $20/lb: Crafting and Marketing a Premium Product"
Learn how your hive management choices affect the honey, how to produce the highest-quality honey with highest nutritional value, and how to market it successfully at the premium prices it deserves. 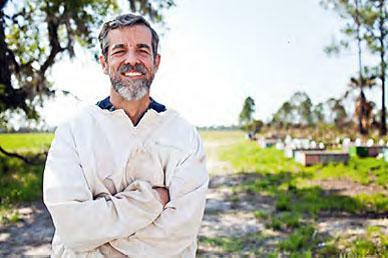 Jerry Hayes past Apiary Inspector for the state of Florida’s Department of Agriculture & Consumer Services Bureau of Plant & Apiary Inspection and is now vice president North America for Vita Bee Health to help beekeepers improve and maintain the health of their honey bees. Jerry will discus the future of beekeeping...honey bee technology, trends in the commercial and hobby industry, and the prospects for bee health. John has been a beekeeper since 2006, is a member of STL Bees and Vice President of Eastern Missouri Beekeepers. John will walk us through fall and late season management tasks for successful overwintering. Please join us on TUESDAY, August 28th at the club's SSA queen rearing apiary from 6:00 to 9:00pm. Along with enjoying the evening with friends and food, we'll talk about our queen rearing challenges, successes and lessons learned at this location and what the plans are for next season. We gather at 6:30 p.m., meeting and presentation from 7:00 to 9:00 p.m. Please join us. These two invasive pests have the greatest impact on your honey bee colony's health. August is when inspection, detection and management is critical to your bee's health and survival for the rest of the year. We'll be sharing important information about identification and control options. Welcome to our new meeting space! We will hear from James "Otto" Ottolini, Chief of Brewing Operations with Brew Hub and learn about their new St. Louis brewing facility and restaurant, their brewing partners and how they help local brewers work on unique and nontraditional brews in small batches. Ottolini received the 2012 Russell Schehrer Award for Innovation in Craft Brewing and serves as an adjunct professor at Washington University in St. Louis. He holds a B.A. in French Literature from the University of Kansas and an Executive M.B.A. from the Olin School of Business at Washington University. We will also hear from Kayla Flamm, GIS Specialist with Missouri Botanical Garden. She will present on her recent experience meeting beekeepers in Kyrgyzstan. We want to hear from you! This month's meeting will feature round-table discussion on the season to-date. How did you do with splits, moves, requeening, supering? What worked and what didn't? We'll also have an update on SHB (small hive beetle) behavior and management so you can be prepared to deal with them this season. Please note, we will be meeting on the patio at Schlafly's Bottleworks for this meeting. Please dress appropriately. This month's featured speaker is Mary Reed from Farmington, Missouri. Mary has been a beekeeper and practicing apitherapist in Missouri for many year and is considered to be the expert on the history and practical use of apitherapy in our area. She will share her knowledge, insights and techniques to help us be healthy beekeepers. Please note, we will be meeting on the patio at Schlafly's Bottleworks for this meeting. Please dress appropriately..
STL Bees and EMBA member Ken Heitkamp will walk us through his spring management tips & techniques for swarm control, plus getting your hives set up for spring and early summer honey production..
Jim Gawenis of Sweetwater Science Labs will explain adulteration testing for natural sweeteners. This includes carbon-13 isotope analysis, sugar adulterant marker analysis and screening for antibiotics and pesticides. We will be discussing why large and small honey producers should be testing their honey. Sweetwater Science Labs started as Coastal Science Labs in 2012. Jim and his team are dedicated to serving and educating beekeepers and honey producers to the importance of ensuring quality of foods and food products through sound science and communication. 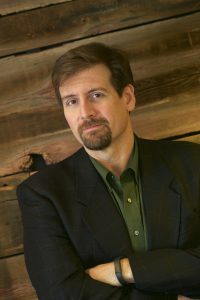 Dr. James (Jim) Gawenis received his PhD in Chemistry from Mizzou in 2001 and his MEd from the University of Utah in 2008. His passion for instrument and methods development is matched only by his passion for teaching others. Kent will share his current thinking on all things beekeeping, including the impact and control of Small Hive Beetles (SHB). Kent has been keeping bees in Kentucky for 30+ years. and is currently a nuc and queen producer and rents colonies for pollination of vine crops, managing 600 hives. Kent is also historian for the Kentucky State Beekeepers Association. We gather between 6 and 6:30 p.m. with the meeting and presentation from 7:00 to 9:00 p.m. The next meeting of the Saint Louis Beekeepers at Schlafly's Bottleworks is Tuesday, November 28th. 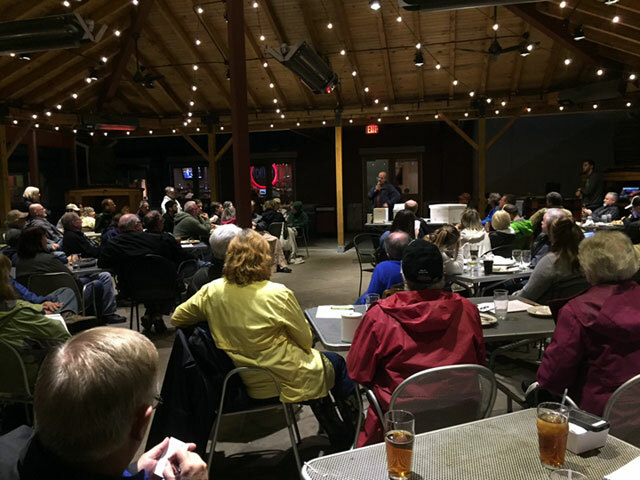 We gather between 6 and 6:30 p.m. with the meeting and presentation from 7:00 to 9:00 p.m.
Keith's topic is "How Brewers Have Embraced Honey"
that covered the wholesale baking industry. Grant Gilliard as our featured speaker. Grant's presentation will be titled "Better Beekeeping"
Grant has been keeping honeybees since 1981 and currently operates around 200 hives in southeast Missouri. His methodology attempts to keep his bees as natural as possible with sustainable practices, including raising his own locally-adapted queen honey bees from survivor stock. Grant has published several books on the topics of beekeeping and personal growth. The US Food & Drug Administration classifies antibiotics approved to control American foulbrood (AFB) and European foulbrood (EFB) as medically important antibiotics because they are used to treat diseases in people. The agency also classifies honey bees as a food-producing animal because people consume the hive products. Veterinary oversight is now required to administer medically important antibiotics in the food or water of food-producing animals. Beekeepers must involve their veterinarian before using antibiotics to treat honey bee hives. DesChene (DC) Brochtrup, DVM, DACVR graduated from the University of Missouri-Columbia College of Veterinary Medicine in 2004 and completed a 3-year Residency in Diagnostic Imaging and Radiology at Kansas State University in Manhattan, KS from 2009-2012. DC practiced in the St. Louis area from 2004 to 2009 including equine ambulatory medicine, small animal and exotic general practice, and small animal emergency medicine. DesChene joined VIS - Mobile in St. Louis in 2012 and is a member of AVMA and ACVR. James Brochtrup graduated from William Jewell College with a BA in Physics in 1998 and went onto study Industrial Health and Safety, Environmental Health and Safety, and finally Information and Network Technology. In 2013, James took on rebuilding a farm Ste Genevieve County and brought their first honey bee hives in 2014. We hope you will join us to learn about this important information. Patrick started making mead while he was an undergraduate studying biological sciences and general chemistry at the Missouri University of Science and Technology at Rolla. Since graduating he applies all of his laboratory experience towards recreating the most ancient of all alcoholic beverages: mead. Along with his brother Derek, Martin's primary goal at Martin Brothers Winery is respecting honey's character while simultaneously highlighting the flavors and character that make each variety and each harvest of honey unique. Patrick's presentation will be about issues of traditional mead fermentation with regards to respecting the varietal characteristics of honey, as well as what mead is and its history." Solomon Parker of Parker Bees and the Treatment-Free Beekeeping Podcast is our featured speaker this month. Solomon will explain what treatment-free really means, why and how it's an viable management option. Solomon Parker is committed to educating new beekeepers who choose the treatment-free path. He is the creator of the Treatment-Free Beekeeping Podcast and the founder of the Treatment-Free Beekeepers' Facebook group which now has over 14,000 members. He has been keeping bees treatment-free since he started in 2003 and he lives in Medford, Oregon where he was born and raised, with his wife and children and bees. Please join us this coming Tuesday at Schlafly's Bottleworks from 6:30 to 9! This meeting will cover honey harvesting techniques and equipment, including extracting, bottling, marketing and storage. For your information, the club has recently received a generous donation of equipment from a local area beekeeping including some extracting equipment, which will be available to club members for rental. We'll provide details at this and upcoming meetings. The team of 6th-7th graders from the Boston area, who presented at our April meeting competed at the Lego FLL World Championships held here in St. Louis on April 28th and 29th. The team of Aly Hodge, Morgan Su, Pria Sawhney, Bradley Winters and Gabriel Shiu with Tech mentor Anhad Sawhney were awarded the First prize in Research for their device designed to treat honeybees for varroa mites, called "Mitigate". The entire competition involved over 255,000 participants in 32,000 teams from about 88 countries. As published in their local newspaper - "This group of three sixth grade girls and two seventh grade boys, assisted by an 8th grade technical mentor all from William Diamond Middle School had spent countless hours: reading books by Nobel Laureates, summaries of PhD theses, websites, books, even a graphic novel on bees. They made many field trips: to an organic farm, backyard bee hives, processing center of an urban apiculture company even the Bee Lab at the University of Texas, Austin! They met bee swarm directors, hobbyist bee keepers, scientists, Congresswoman Clark and many Lexington residents as they worked on the three components of the First Lego League competition: Research, Robotics and Core Values." They did a great job presenting their concept and design and we'll keep track of their progress and testing results. Stu started keeping bees on Cape Cod, Massachusetts in 1973. After getting his PhD in biology, he spent one year studying Africanized bees in Venezuela; he has also conducted research on honey bee management, overwintering nucs and on small hive beetle (SHB). 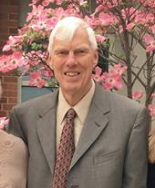 Stu is retired from the University of Illinois, Springfield, where he conducted education programing for university extension. He coordinates the Illinois Queen-rearing Initiative (IQI) where he obtained two USDA grants for increasing the production and use of locally-adapted, disease and mite resistant queens. We will also meet and hear from special guests, a team of 6th-7th graders from the Boston area, who will be in town to participate in the annual First Lego League (FLL) World's Robotics competition in St Louis the week end of April 29th and 30th. The Plasmabots team will share the story about their prototype for varroa mite control that won the Massachusetts state competition. John is Vice President of the Eastern Missouri Beekeepers Association, member of the Saint Louis Beekeepers, third generation beekeeper and honey bee enthusiast with about 15-20 colonies in Pevely, MO. John has kept bees for the last 12 years and has mastered many DIY opportunities that beekeeping provides, from building equipment to making candles, lip balms and mead. John will present on "Minding Your Beeswax", helping to answer the question, "Now that I harvested my honey, what do I do with all this wax?" He will share his methods of processing wax into a useful product, making solar melters and will discuss filtering options. We'll also enjoy sampling of the honeys provided for the club's 5th Honey, Mead and Wine tasting, that took place on February 17th. Phil Ebert began Ebert Honey in 1980 with only ten colonies. 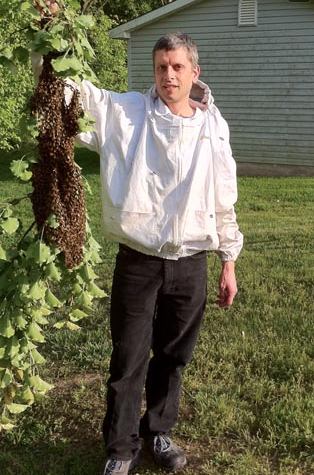 They sat in the backyard of his Fairfield, Iowa home and at that time, one five gallon bucket of honey seemed like a large amount. Once the honey was bottled, it was mainly sold out of his house. Today, Ebert Honey maintains nearly 1,200 hives near Lynnville, Iowa which produced 70,000 lbs of honey in 2016. Processing and bottling takes place in a steel building erected in 1996. Phil will share how he started and built up his business and will talk about how commercial beekeepers handle their bees. 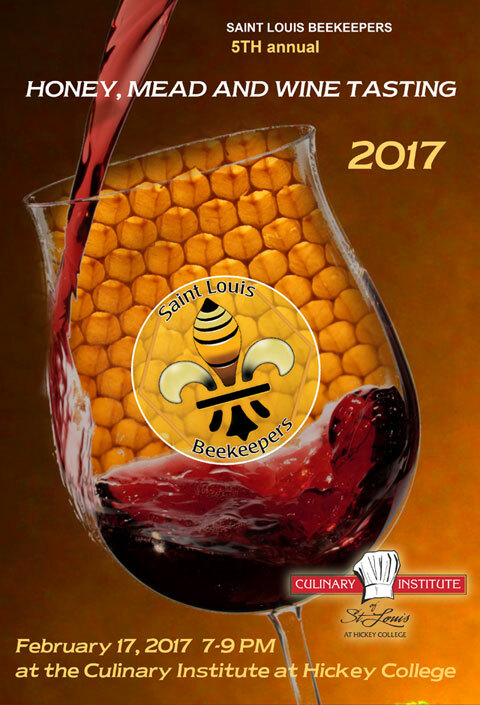 We will be partnering again with the Saint Louis Culinary Institute at Hickey College and select Missouri wine and mead producers and crafters. Greg manages 25-30 Russian colonies and produces nucs near Elsah, Illinois. He will share his insights into the unique management practices he believes critical to be successful with Russian honey bees. Greg has been keeping honeybees for 20 years and treatment-free Russian colonies since 2002, raising queens from the hardiest traits from his own stock. In the spring of 2016, Greg and his wife Connie started a 20 acre prairie for pollinator habitat. We hope you join us any time after 6 p.m. for refreshments or a meal with meeting and presentation beginning at 7 p.m.
Bring any beekeeping or related title with you when you attend a meeting and swap it for something you've yet to read. Dwain and Jane will present on their use of oxalic acid as a treatment for varroa mites this season. Each used a different protocol for vaporization and will present data on their results. We will review varroa mite biology, what the beekeeping community is currently working on and what treatments are recommend for the coming winter and spring. We'll also discuss winter feeding. Bring your questions and ideas!. Saint Louis Beekeepers is excited to have Cory Stevens back for a "homecoming" meeting at Schlafly's Bottleworks. Cory was our very first presenter when we moved to the Crown Room, or current meeting location. Cory and his wife Jaime are parents to two children, Jade Olivia and Camden Lane and manage 80-100 colonies with a queen breeding operation in Dexter, Missouri. The Stevens' focus is on pest and disease resistant traits (VSH and hygienic genetics) in their breeding stock. To propagate and select the hardiest of genetics, Cory avoids treatments in his colonies. He is "focused on breeding disease-resistant honey bees; bees that can naturally keep a clean disease-free brood nest." As a 2013 Certified Master Beekeeper by Eastern Apicultural Society of North America Education (EAS) and trained and outfitted by Susan Cobey in 2014 to instrumentally inseminate queen honeybees, Cory's queen breeding operation has proven success. Cory has served as Past Southeast Director for Missouri State Beekeepers Association and is in high demand to instruct quality queen rearing workshops all across the bi-state area. Native Plants: Beyond Beauty - Plants that REALLY work! Native plants, beyond their inherit beauty, contribute significantly to both natural and human created landscapes. From providing a valuable food and fiber source, to mitigating rainwater at both residential and commercial landscapes, to providing beneficial wildlife habit for human benefit and enjoyment, native plants realize truly sustainable and healthy landscapes. Learn how the use and conservation of native plants can bolster your quality of life! Grow Native! resource information will be provided. Corey Gunnell, Vice President of Pop Up Prairie, will be discussing the organization's mission of Habitat Re-fragmentation and why they are excited to work in an urban environment. Our featured speaker is Pete Snyder with the National Agricultural Genotyping Center (NCGA), a not-for-profit orginzation with new offices here in St. Louis. Pete will present on the NCGA's work concerning honeybee diseases. Snyder is President & CEO with NAGC, a not-for-profit organization that has been funded by agricultural producers. Its mission is to translate scientific discoveries into solutions for production agriculture, food safety, functional foods, bio-energy and national security. Prior to joining NAGC, Snyder headed up Snyder Consulting in 1999 and worked with clients like the St. Louis Police Officers Association, EnTech Engineering, the St. Louis Fire Sprinkler Alliance, and the St. Louis College of Pharmacy. Snyder is a graduate of Cornell University College of Agriculture & Life Sciences where he took classes in beekeeping. This month's meeting will cover varroa mites - life cycle, known impacts to your colony's health, testing and treatment options. Jane Sueme and Ken Heitkamp with demonstrate treatment tools and products including oxalic acid.. This month's meeting will cover honey production and harvesting. We'll demonstrate uncapping, extract and bottle from some medium frames for liquid honey. We'll cover how to get the honey boxes off the hives, best practices for harvesting and bottling, as well as storage options for honey supers. Plus, we'll share ideas for what to do with your wax cappings. Please join us and share your tips and tricks. Dr. Greg Hunt, Purdue Univ., Dr. Jennifer Tsuruda, Clemson Univ., Dr. Tom Webster, Kentucky State University, Dr. John Skinner, Univ. of Tennessee, Dr. Tammy Horn Potter, Kentucky Dept. of Agriculture, Krispn Given, Purdue Univ., Michele Colopy, Pollinator Stewardship, Mike Studer, Tennessee Dept. of Agriculture, Michael Wilson, Univ. of Tennessee, Dr. Clarence Collison, Mississippi State Univ., retired, Mike Goblirsch, Univ. Minnesota, Marty Matisoff, Kentucky State Univ., Doug Potter, Kentucky State Univ., Laura Rogers, Kentucky State Univ., Gabe Blatt, West Virginia State Beekeeping Assoc., Susan Kivikko, Illinois Dept. of Agriculture, Stu Jacobson, Illinois State Beekeeping Assoc., Kent Williams, Kentucky State Beekeeping Assoc., Rick Sutton, Kentucky State Beekeeping Asoc., Jerry Hayes, Monsanto and American Bee Journal, Shawn Williams, Ohio State Beekeeping Assoc.. Successful natural beekeeping requires local bees and locally adapted hives. The vast feral population in the Ozarks can supply hardy local stock, and you can adapt any hive model to create bee habitat that mimics bees' natural ways. If you aspire to simple and healthful treatment-free beekeeping, Dr. Leo's visually rich presentation will offer a broad range of ideas that can be applied to your existing operations, or will encourage you to get started. "Introduction to Urban Pollinator Study"
Insights will be presented from a study conducted by Saint Louis University with support from Missouri Department of Conservation, regarding social and biophysical research on urban pollinator health in St. Louis City. The study uses long-term bee sampling data and science communication to answer the question 'Can communities plant our way out of a pollinator health crisis?' The research team is lead by Dr. Gerardo Camilo (Department of Biology) and Dr. Damon Hall (Center for Sustainability). The team has been sampling 15 sites over the past 3 years across the city as well as conducting targeted research at 2 sites this summer to improve foraging resources for urban bees. The SBYT is to provide an opportunity for neighbors to meet each other and see firsthand how others are transforming their yards from energy intensive lawns to something more sustainable. Pop Up Prairie is focused on the use of native plants in urban landscaping to promote biodiversity for insects, birds and animals. Our mission is to inspire city dwellers to transition their piece of the community from a turf dominated landscape to a functioning, native ecosystem. "Spring Splitting for Swarm Control"
Steve began keeping bees in 1974 and has experimented with many different beekeeping practices over the years. He lives in rural Boone County, near Columbia, managing about 80 hives for honey production. Steve currently serves as treasurer of the Missouri State Beekeepers Association. We will be discussing why large and small honey producers should be testing their honey. Jim Gawenis of Sweetwater Science Labs will explain adulteration testing for natural sweeteners. This includes carbon-13 isotope analysis, sugar adulterant marker analysis and screening for antibiotics and pesticides. Winter is when the bees "take a rest" and the beekeepers sit back with a good beekeeping book. The club's book swapping library needs some serious rejuvenation. If you've borrowed a book in the past several months, planning to replace it at a future meeting, please do so this month. Saint Louis Beekeepers is excited to welcome Derek Marin, Returned Peace Corp volunteer (2013 - 2015) and beekeeper. Derek earned a BS in Environmental Biology from Illinois College and an MS in Recreation, Parks, and Tourism Science from Texas A&M University. After college, he served in the US Peace Corps in The Gambia, West Africa as a Natural Resource Management Specialist where he received his first ever training in beekeeping. In The Gambia, Derek embarked on the design of a training program called 'Holistic Planned Beekeeping,' which includes theory and practicals in value added product making, bush-craft/natural beekeeping, financial planning, natural resource management, and social planning. "In The Gambia, 'bee killing' is the traditional way people harvest honey in the forest. This process includes putting fire into the wild hive in the tree, which can cause bush fires, it kills pollinators, and gives an unhealthy end product which is consumed, causing further illness. With the program, we were able to train locals in nine communities and formed what is now known as the Sami Beekeeping Association in order to create income for locals while saving the forest from these bad habits and attitudes. It provides a venue for locals to get training, as well as to collect honey and wax for value added products for selling." Check out the association's progress on Facebook under: Sami Beekeeping Association. Join us for a year-end (or year-beginning) Club Round Table. We'll open the floor for comments, questions and in-depth discussion of beekeeping topics that are on your mind. We will also cover winter feeding and recommended winterizing techniques for our area. Come early to sample local and single source honey. At 6 p.m. will be set up for a revival of the honey tasting from the inaugural Honey Festival, held on September 26th. You'll be able to taste the People's Choice winning entry. Share a beekeeping related title that you're ready to pass along to someone else in the club in exchange for one you'd like to read. Sign Up Now for Bob Finck's Mead making Class! Bob Finck will hold his "6th annual mead class", wine (mead) and cheese/snack party on Thursday, November 12, 2015 starting at 7:00 PM. First time and previous attendees are welcome. A handout with complete instructions will bee provided. Bob will explain every step in the process of making an excellent mead. There is no cost to attend, however, please feel free to bring a snack item, but not required. If you must cancel please notify Bob as soon as possible, he usually has a waiting list. Take the next step to getting pesticides and fungicides out of your hives. Commercial foundation commonly purchased for Langstroth hive frames is full of chemical residues which are absorbed by the wax and stay in your combs. Going foundationless is easier than you think. STL Bees co-founder Judy Ivery will talk about her experiences with foundationless frames and will give her tips and tricks to help you ditch the foundation! We will also cover fall feeding practices as well as answer your other seasonal management questions. ALSO, if you would like to submit a 1-pound jar of your honey for the People's Choice award of $100.00 at Honey Festival on September 25th, you are welcome to bring that to the meeting. The next meeting of the Saint Louis Beekeepers at Schlafly's Bottleworks is this coming Tuesday, August, 25th. Our featured presenter is club member Skip Smith who has been successfully overwintering TBHs in our areas for several years. Skip will talk about Top Bar beekeeping concepts and share his tips and tricks for overwintering colonies in this style hive in our area. We will also cover fall feeding practices for TBHs and Langstroth, as well as answer your other seasonal management questions. The next meeting of the Saint Louis Beekeepers at Schlafly's Bottleworks is this coming Tuesday, July 28th. Our featured presenter is Bob Finck, past president of Eastern Missouri Beekeepers, longtime beekeeper and expert craft mead maker. Bob will share his expertise in all aspects of honey production from removing honey supers to extracting and bottling, to storage techniques. We will also cover fall management practices for varroa mite testing and control, as well as answer your seasonal management questions. Please join us on Tuesday, July 28th! Join us for a special event announcement. 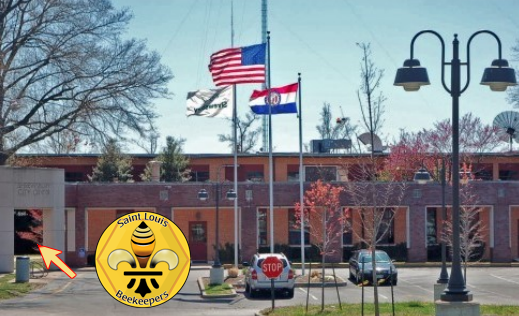 The next meeting of the Saint Louis Beekeepers at Schlafly's Bottleworks is Tuesday, June 23rd. Our featured presenter is Eugene Makovec, a 20-year beekeeper living in rural Lincoln County Missouri. He ran a home-based photography business for two decades, shooting weddings, portraits, team photos and other odd jobs. As the beekeeping passion took up more and more of his time, he gave up the photography gig, and once again takes photos just for fun. Among other places, his photos appear in the Missouri State Beekeepers Association newsletter, which he has edited for the past 10 years. Eugene will talk about honeybee photography. In addition to covering some basic rules and techniques, he discuss understanding your digital camera's settings, and overriding them if needed. He will also cover guidelines for saving your digital files for different end uses. Eugene will also share details and bring everyone up to speed on the current efforts to successfully change Missouri's honey laws, effecting all beekeepers who bottle and sell honey. Perceptions & ExpectationsHow Do We Share Our Space with Native Animals? Why don't all environmentally concerned homeowners landscape with native plants which provide ecological services to their yards, neighborhoods and the ecosphere? The short answer is probably rooted in perceptions. To help us explore these perceptions, Dave Tylka will explain how native landscaping is like a marriage between horticulture and ecology and help us arrive at the realization that there is not a magic recipe to successful native landscaping. Besides discussing how humans perceive their landscapes, Dave will explain how we can use borders and mulches to change some of these perceptions and improve the attractiveness of native landscapes, especially for neighbors who suffer from the "neatness syndrome." Tylka will describe how native animals find habitat and why they select certain leaves, pollen, nectar and fruits to feed on. And finally, Dave hopes to dispel some urban myths: that all flies are disease-carrying agents of evil and that caterpillars eating your landscape plants should be eradicated. Our featured speaker will be St. Louis City resident and Eastern Missouri Beekeeping Association board member Scott Jackson. Scott started keeping honey bees as a teenager, took a break for a career (or two) and started up again 10 years ago. 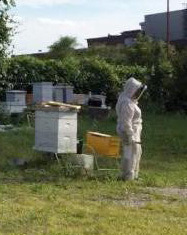 He is an urban beekeeper and has had great success at catching swarms in bait boxes. Scott will share his insights, tips and tricks for east swarm capture. We will also cover spring management practices for swarm control and answer your seasonal management questions. The Pollinator Project, a group of students from Parkway North High School in St. Louis, Missouri will be our featured presenters. Abby Lammers and her team are working on a research project that investigates the effects of pesticides on bees and endangered butterflies. During their research, they noticed that there is very little data on pesticide persistence in the environment, specifically with regards to neonicotinoids. Therefore, they have created a video and petition to propose that chemical manufacturers should market a test kit for their chemicals so that citizens can test for the presence and persistence of these chemicals themselves. See more at Pollinator Project. We will also cover spring management practices for varroa mite control and answer your seasonal management questions. Tim Wilbanks, Owner of the Kalona Honey Company, will be our featured speaker and will share what it takes to move from a hobbyist beekeeper to a sideliner in the modern age of beekeeping. Tim is a fifth generation beekeeper having grown up in Claxton, Georgia working in his family's commercial package and queen rearing business, The Wilbanks Apiaries, Inc. He moved from Georgia to rural Southeast Iowa as a chiropractor, but with four young children at home, his desire to be in the office less and "in the yard" more gave birth to Kalona Honey Company. Tim resides on a small hobby farm with his queen bee, Sarah, and brood, Ansley, Harrison, Reed and Priscilla. On any given day, the children will be seen along side dad in the operation, usually begging to stick their finger in a honeycomb. Friday, January 23rd, 2015 7:00 - 9:00 p.m.
We are thrilled to have Grant back to present, just on the heels of publishing his latest book (and best yet) titled "Sustainable Beekeeping, Surviving In an Age of CCD". He will share his insights on what constitutes sustainability, how to determine if you, yourself are sustainable, how the bees practice sustainability and what management practices can support their efforts. "We're giving Warre Hives and Top Bar Hives serious consideration. But sadly, even these less intensive methods of keeping bees face the same challenges as the commercial, conventional and traditional methods of keeping bees in Langstroth hives." "There is an intriguing, underlying, mystic spirituality to keeping honeybees and the longer I keep bees, the more I respect what they do and how they go about doing it." Grant has been keeping honeybees since 1981 and currently operates around 200 hives in southeast Missouri. Along with his wife Nancy, the Gillards market honey for local retail sales and farmers' markets. His methodology attempts to keep his bees as natural as possible with sustainable practices, including raising his own locally-adapted queen honey bees from survivor stock. Grant also produces nucs, removes swarms and has published several other books on the topics of beekeeping and personal growth. We are excited to bring one of Europe's leading natural beekeepers and founder of Russia's largest honeybee conservancy. Fedor Lazutin is author of "Keeping Bees With a Smile: A Vision and Practice of Natural Apiculture" and will be our guest at the Saint Louis Beekeepers October meeting, this coming Tuesday. Large horizontal hives are traditional across Europe and still used on a major scale. Come here the many advantages they offer to beekeepers. 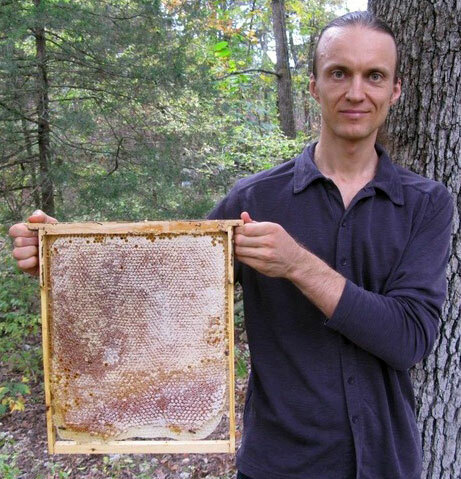 Fedor's visual presentation will include a horizontal hive demonstration and cover many methods applicable to any hive model, including swarm traps and natural swarming, treatment-free hives, foundation vs. foundationless comb, simplified beekeeping in one-box horizontal hives and much more. We are pleased to have Cassie Vernier of Washington University sharing her current research at Tyson Research Center with us next Tuesday. Her topic is "The honey bee as a model for understanding the evolution of cooperative social groups". Cassie Vernier, 2nd year graduate student in the Ben-Shahar Lab at Washington University in St. Louis is interested in the evolution of social behavior, particularly understanding what genes and biological mechanisms influence animal sociality. In the Ben-Shahar lab, she uses the fruit fly and the honey bee as animal models for understanding this. Cassie received her bachelor's degree from the University of Michigan in 2012, where she majored in Ecology and Evolutionary Biology. In addition to Cassie's talk, will also have a panel of beginning beekeepers (1 to 3 years experience) share their successes and challenges from the 2014 season. If you would like be one of our panelists, please drop us a quick note at contact@saintlouisbeekeepers.com We'd love to have you participate! Our featured speaker this month is Doug Bauer, President and Co-Owner of DJM Ecological Services, a 20-year old company where he managing operations and focuses on strategic growth. Most recently DJM purchased Pure Air Natives a Missouri based native seed supplier, offering agriculturally focused products, technical expertise and accessibility to the professional architect, engineer, designer and contractor market. Doug will share his expertise in habitat restoration, knowledge about Missouri native plant conservation and provide information about Pure Air Native's professional services. Doug has a bachelor of science in natural resources and environmental studies from the University of Illinois and fought wildfires on the west coast during his college summers. From there, he went to Chicago and completed an MBA from University of Chicago while working for a native restoration company as Vice President. It's turned into a good season for the honeybees here in the St. Louis metro area. Established colonies that survived the winter as well as new colonies that were able to build their numbers during the cool spring have made nice honey crops. The end of July is the best time to harvest, while the weather is warm and the honey will flow! Immediately after harvest is the time to focus on varroa mite control. Eleanor Schumacher, Illinois Apiary Inspector, Department of Agriculture and Editor of the ISBA Bulletin at Illinois State Beekeepers Association will present at this month's meeting on varroa mite testing and treatment, control and prevention. Saint Louis Beekeepers welcomes Phil Minden a local St. Louis beekeeper. Phil also wrote the business plan for Sweet Sensations which won the YouthBridge/SEIC social entreprenuership competition sponsored by the Skandalaris Center at Washington University in 2012, resulting in a $35,000 seed grant. Sweet Sensation is a business concept that uses beekeeping to provide employment opportunities and teach entrepreneurship and small business skills to under-served teens on the City’s north side. Honey and beeswax, the byproducts of beekeeping, are the basic ingredients of many value added-products, including candles, soaps, lotions and gels, and lip balm. Teenagers can participate at all levels in the care of bees, as well as the development and sale of these products. Additionally, planning and operating a sustainable, environmentally-friendly beekeeping business provides excellent opportunities to teach teens the basics of small business management. Arvin Pierce of acbees apiaries, southwest of Springfield Illinois, has been keeping honeybees for over 12 years. Other than wintergreen grease patties in his first year, Arvin has not used any kind of treatment or chemicals in his hives. Arvin does not buy bees but rather procures bees for his growing apiary by capturing swarms and providing colony removals (cut-outs). Arvin is also a photographer and videographer has documented much of his beekeeping activities. He shares his experiences in natural beekeeping wherever possible and the Saint Louis Beekeepers is pleased to have him join us for our May 27th meeting at the Schlafly Bottleworks in Maplewood Missouri. Please visit Arvin's webite at acbees.org. Fred Meder of Mi Armada Apiaries and the Quad Counties Beekeepers club will present on the Nicot queen rearing system. Fred has been a beekeeper for five years and learned the Nicot System several years ago to raise queens for his own expansion as well as to sell nucs from local stock. March 25th featured speaker is Mary Reed from Farmington. Mary has been a beekeeper and practicing apitherapist in Missouri for many years. She will share her knowledge, insights and practices to help us be healthy beekeepers! Friday, January 17th, 2014 6:30 - 9:00 p.m. The November 2013 meeting presentation by Mervin Wallace owner of Missouri Wildflower Nursery shared insights on selecting native plants for pollinators. 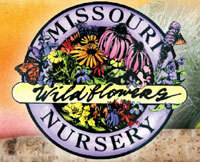 Please visit Missouri Wildflower Nursery to order native plants and learn more about the virtues of going native in your garden.